“Peters!” Shade called out as they approached the man, even though she knew it could not be him. The man turned, and it was him. It was Peters, her supposedly dead husband. Was Shade dreaming? Was she out of her mind? Was she dead and was now meeting Peters in the land of the dead? How could this be? An avalanche of questions walloped her head. Shade shook off the questions and brought her mind back to what was at hand. At first, she was confused, but she got over that quickly. She had experienced too much in recent days already, so almost nothing could now keep her perplexed for long. Their eyes met, Peters’ and hers. Shade expected to see the joy of reunion envelope his mind like it did hers; she sought to discern in his face the ecstatic feeling of one who’d recovered what had long been lost, but all her efforts to see such proved abortive. All she saw was a perfunctory smile, empty and unfeeling. This was not the Peters she knew. She was surprised when he dismissively waved at her, muttering something that was meant to be her name and then went about his business. Shade should have known that two years was enough time for amazing changes to take place in a man. She should have known that love, or whatever they shared, was sometimes like a garden that needed regular care and watering. On the one hand, if you gave the garden enough attention, it could bear beautiful flowers, blossoming trees and tasty fruits, but on the other hand, if you abandoned it long enough, it could also all wither away or grow wild and worthless. Still, she did not believe their own love could be like that of a garden. No, she didn’t want to believe that. Sincerely, what did she expect of a person who had been brainwashed? She could feel all these things because she was still sane. She could feel them because she had fought to keep her head and was lucky to succeed. Others like Peters had not been so lucky. This was the only admissible explanation. Shade saw more people as she went down the hallway with Catherine. They were all young ladies and gentlemen, soulless and blank like empty bottles, carrying out duties with straight faces and vim. “We’ll get to Grrh’s place in a giffy,” Catherine said, assuring her. At the end of the hallway was a lift. They got in. Catherine tapped some buttons on its control pad after the door had closed. Shade felt a slight weightlessness as the lift accelerated upwards. Her heart was now thumping vigorously against her chest. An anxiety she could not readily put her finger on had gripped her. The elevator jerked a bit and stopped. They got out. The whiteness of the apartment they stepped into dazzled her. She thougt she had gotten used to this already, but something seemed different about this place. It had a perceptible aura of authority peculiar to it, which no other place within The White Empire possessed. Catherine took a gracious bow and threw her hands forward as if to say, “Welcome to the presence of Grrh the Game Master”. Immediately, she turned back and left. Clueless, Shade stood alone and looked around, taking in the vastness and heavenliness of the condominium. “We finally get to meet, Mrs Shade Ade. May I personally welcome you now to The White Empire,” a voice boomed out. Shade looked around frantically, trying to identify where and from whom the voice came. “Relax. I’m right over here,” the voice said, sounding harmless. Shade knew better than to be tricked by the friendliness of the voice, though. She turned sideways and saw someone sitting cross-legged on a table. The person was flicking a fountain pen side to side with a hand. It was Grrh. “Please come over here,” Grrh said, beckoning to Shade. Although Shade had had enough surprises over the days, she was certainly unprepared for this. Few metres away from her stood a stunning lady in her early thirties, dressed from head to toe in white. She had a chocolate complexion, with black long hair and dark eyeballs. Her cheekbones were delicately raised, and she was well over 5 feet from Shade’s assessment. It beat Shade’s imagination that this rare beauty could be the evil perpetrator. Appearance could be very deceitful, she thought. As Shade covered the distance between them more and more, bitterness welled up in her- a bitterness so strong it altered the rhythm of her breath and plugged her throat- but Shade kept an emotionless countenance nonetheless; that much was expected of her. “Kindly have your seat,” Grrh said softly. She got up from the table on which she was sitting and made for a swivel chair opposite where Shade sat. They were now separated by the table, on which a glass chess board was carefully laid out. “We’re finally going to play the real game,” Grrh chuckled, her eyes running over the chess board. The pieces had been arranged in their respective positions on the board. “I take the white, and you take the black. I know you have questions. Whatever questions you want to ask me would be answered by or in the course of this game. So, I’d advise you to be attentive,” she informed. Shade kept mum. This lady must be dumb, she thought. How would a chess game explain how her husband and her son had been estranged from her? How would it justify the loss of their minds? How would it dismiss the false news about their ‘deaths’? How? 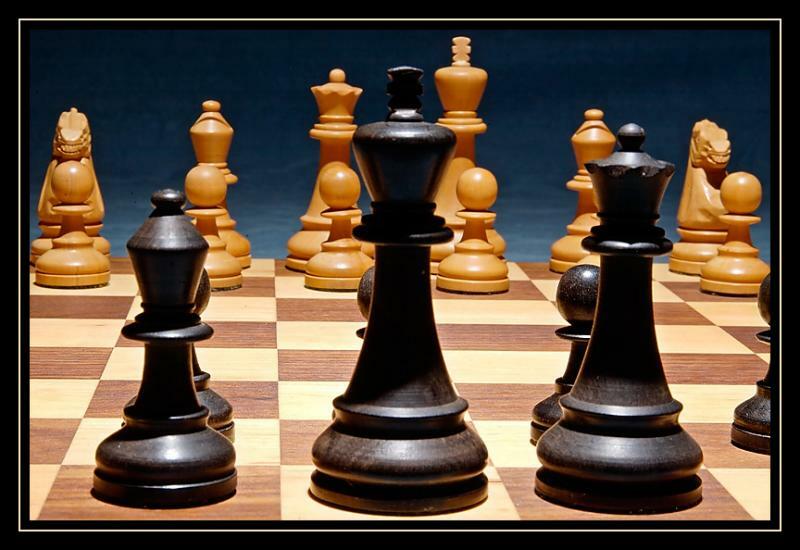 “White plays first,” Grrh said, moving the pawn in the front of her king a square forward. Shade took the pawn in front of her rook a square forward also. Shade moved the pawn in front of her other rook two squares forward. Grrh unleashed her queen, taking her two squares diagonally. Shade moved a knight. Shade looked at the game closely. Her king was truly in check, and her king could not capture the queen that threatened his existence because the queen had a bishop as a backup, diagonally in line with her. She smiled. “Maybe it’s not a checkmate yet,” Shade said, then captured Grrh’s overbearing queen with the knight she had moved earlier. Grrh’s jaw dropped in astonishment. Grrh’s eyes were wide open in dismay. The words coming out from Shade’s mouth defied that expected of a person brainwashed. Before she could say Jack Robinson, Shade reached across the table and dealt her a blinding blow in the face. The blow sent her flying off her chair and sprawling on the floor. Shade ran up to her in time just as she was about standing and kicked her with her legs by the side. Grrh groaned in pain. The bitterness that had plugged Shade’s throat was now strangling her. She wanted to kill this devil that had made her life miserable once and for all. She looked around and saw something like a rod at a corner of the room. She went for it. Grrh, with much effort, got up from the floor and braced herself for the worst. It was in expectation of an occurrence like this that she had learnt Taekwondo 8 years ago as part of her preparation for this work. Her skills were finally going to come in handy now. Shade got the iron rod. She walked over to Grrh’s side, aimed for her head and struck with all her might. Grrh ducked just in time. Shade had thrown too much weight behind that attempt and so had lost balance. Grrh threw her a hurtful uppercut that made her flop into a chair. Blood was now trickling down Shade’s mouth. The taste of her own blood in her mouth made her mad. She jumped up with rage and kicked Grrh squarely in the face. Shade was sure the kick was heavy enough to break Grrh’s nose, and it surely did. Both of them were bleeding now, staring at each other savagely. The whole place was getting messy. Patches of blood had begun blemishing the immaculate room. Shade ran towards her and made to hit her again, this time with her knee. Grrh blocked the bang with a hand and punched her in the stomach. Shade bent over as the burning pain saturated her body, holding her tummy with her hands. Grrh then drove her elbow into her back with great impact. Shade stood straight immediately, arching her back forward. Her legs went weak under her and she fell upon the table face up. Grrh sat on her and kept on raining blows upon her head. Shade’s hand wandered on the table feebly. It touched the glass chess board. She picked it and hit its vertex against Grrh’s head with surgical precision. The chess board shattered. Grrh went limp on the floor, her head oozing out blood like a punctured tank. Shade picked a piece of the shattered glass and jabbed at Grrh’s chest. The glass piece sank in and stuck. Shade pulled it out with force and stabbed again. Blood flowed ceaselessly, drenching the duo like rushing waters. The memory of all the trauma Shade had been through played in her head. She pulled out the glass piece again and drove it in one more time. Grrh’s ribs gave way under the pressure. Shade could feel the glass piece bite into her heart. Grrh was now still. She was no longer struggling. Shade’s hand was bleeding too. She held the glass piece too firmly that it cut her palm, but she didn’t care. Shade wept because she could not bring herself to stop. Blinded by fury, a sense of loss and pain, Shade kept jabbing at Grrh’s heart endlessly. She would pull it out and drive it right into the centre of her heart again, and again and again. Tears and blood flowed. The “Fair Game” dosage has ended today. As much as I enjoyed writing it, I’m also pretty sure that you folks savoured every bit of it. My special appreciation goes to everyone who said a word of encouragement to see to the success of this. Another TGIF Special starts next Friday. We can only keep our fingers crossed till then. I wish you all a merry Christmas and a prosperous new year in advance. Am not satisfied with where it ended, yes shade killed d monster but I feel as if it isn’t finished. Well, to me that is. Sometin is missing! I think i understand why it ended the way it did, you can conclude the story anyway you wish to. Good job! Thank you, Mariam. Fictions are always like that, always with questionable ends. Hehehe. Gbemy, you want another dose? Well, I also feel something is missing. Perhaps it’s always like that. I agree with you gbeminiyi, something sure is missing. What happened to all the brainwashed residence of White House, most especially, what happened to Peter, Shade and their son? Please Omoya, we need an epilogue o! All that said, you did a wonderful job. I love every bit of it! Keep up the good job, thanks!! Epilogue? Okay o. I hear but I no gree. You people want me to tell you everything, abi? Wow! Really? It’s nice to bring an end to the works of the evil doer. But the way you narrated the fight, hmmm… You must have been watching much of those jack chan films o. 😉 it’s a nice write up. Keep it up. Oho, you caught me red-handed. I did watch enough of that when I was younger. Thanks, Temmy, for the compliment. I really appreciate it. finally oppurtunned to read this story series. but Mr writer u deserve some bit of punishment. suspense is allowed but not the high mental pressure type of suspense. I am seriously thinking what happened after. Oluomotoye, you must forgive me for this. I should learn to be more discreet next time. Lol. Thanks for stopping by, man.